Dr. Elina Ibrayeva receives the Professor of the Month award from Mortar Board students. Joel Beckwith, junior finance and marketing major from Valencia, California, and George Chen, senior business administration major from Lincoln, Nebraska, were recognized at the Commissioner’s Recognition for Student Excellence in Career Education held November 19 at the Nebraska State Capitol Rotunda. The recognition assembly is conducted to honor students who had outstanding performance at their respective National Leadership Conferences. Beckwith, who also serves as the Phi Beta Lambda Mountain Plains Region Vice President, received first place in the marketing analysis and decision making event and Chen placed first in the microeconomics event at the national Phi Beta Lambda conference held June 28-July 1 in Baltimore. Dr. Sang M. Lee, professor emeritus of management, received the inaugural Lifetime Distinguished Educator Award from the Decision Sciences Institute, a global society of more than 1,800 business school scholars dedicated to creating, developing, fostering, and disseminating knowledge to improve managerial decisions and decision-making involving systems and people. The award recognizes an active member of the institute who has made exceptional contributions to teaching and learning in the disciplines of decision sciences. Eleven Nebraska Business freshmen were recognized as Big Red Scholars by the university at a reception held November 16. 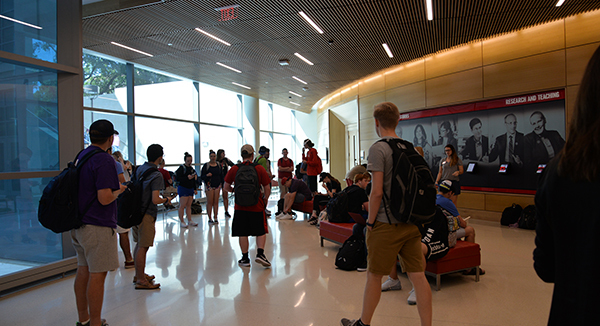 Big Red Scholars are students who are National Merit and National Hispanic finalists or who have a perfect ACT/SAT score, putting them in the top one percent of the university’s 2018 freshmen class. Students honored included: Jessie Benefee, supply chain management major from Flower Mound, Texas; Christopher Burgess, marketing major from Overland Park, Kansas; Ashley Clegg, marketing major from Lincoln, Nebraska; Stan Drvol, actuarial science and math major from Bennington, Nebraska; Diego Mejia, economics major from Paramount, California; Christopher Munoz, accounting major from Covina, California; Molly Olander, actuarial science major from Burnsville, Minnesota; Ryan Olsen, actuarial science major from Aurora, Colorado; Emma Rose, actuarial science major from Wentzville, Missouri; Bella Tran, management major from Southlake, Texas; and Thomas Wolfe, international business major from Leawood, Kansas.